As a kid, I wasn't really a finicky eater. I ate most things my parents did. They made Alaskan King Crab, mussels, fried squid (with the tentacles) and other types of foods that most kids would cringe at. The one food I would never touch was beef liver. I hated the smell and most of all, I hated the taste. It was vile. I didn't know how they could eat the stuff. When my family would all go out for dinner, there was usually a salad bar. My mom insisted I try some stuff that looked like cat food. It was liver pâté. I loved it. I wanted more and kept piling it onto my dish. But whenever Dad would make it at home, I didn't like it. It was in its natural form, fried or sautéed with a ton of onions. I watched him make it as the smells spoke an entirely different story to its taste. As an adult, at the age of thirty-four, my wife had to undergo a partial hysterectomy because she had four humungous fibroid tumors living on her uterus and another attached to one of her ovaries. She found out she had to get this operation while shopping in the grocery store with me one day. I turned around and her lips were blue. Her skin was pale; ash-colored. We immediately got her a blood test and the nurses all looked at one another and said, "How are you even walking around like that?" She had so much blood loss, that her anemia went borderline sickle cell. I was told to cook things loaded with iron like steak, liver, clams, mussels, spinach and on top of that, iron pills. As Madelene was convalescing, I had a ball barbecuing steaks for her and making sure her levels were up. But then, she asked for something I never made before....chicken liver. I remember we were vacationing in the Hamptons one week and she was so scared that she would have some health issues, but I thought it was a good opportunity to just sit by the ocean, make her whatever she wanted and take care of her. It was then, I made my first chicken liver dish. It was so hard to eat at first. I didn't like it at all. But, even as I cooked it more at home, I started to notice the health benefits of it. It helped with my PMS, and menstrual cycle greatly. I also noticed it helped my mood a lot. I felt great after eating it. Chicken liver can supply the body with over three times the daily needed value of vitamin B12, an essential nutrient which supports the production of red blood cells and helps prevent pernicious anemia. Many people probably didn’t know that it is brimming with vitamin A in the form of retinol, alpha and beta-carotene including lycopene. At 14378 IU, it’s a very powerful supporter for healthy vision. If you’re pregnant or planning to get pregnant, chicken liver is good for you. With its 560 mcg of folate, it helps promote fertility as well as prevent neural tube defects for the developing baby. Soreness around the lips, mouth, and tongue and cracking and/or peeling of the skin at the corners of the mouth and around the nose indicates a lack of riboflavin in the body. Riboflavin, also known as vitamin B1 is essential for normal reproduction, growth, repair and development of body tissues including the skin. Chicken liver is loaded with 2.3 mg of riboflavin. It is also brimming with selenium, a mineral which supports iodine to keep the thyroid gland in top shape. With its rich pantothenic acid, it helps the body combat stress by supporting the adrenal glands. In addition to its role in preventing anemia, iron also keeps the immune system in top condition and chicken liver is an excellent source of this essential mineral. Lack of niacin supply in the body will show in the form of pellagra, a disease with symptoms that include delusions, diarrhea, inflamed mucous membranes and scaly skin sores. Chicken and tuna are some of the highest sources of niacin. One of the many health benefits of protein is keeping the skin, muscles, hair and nails in top condition and chicken liver is another excellent source of this very important nutrient. It is also good for the teeth, gums and bones through its rich phosphorous content as calcium cannot build teeth and bones without the aid of this mineral. Egg & bread your little guys. Make sure you use breading that has Italian seasonings or you can season it yourself to your liking. Pile them on a separate dish, so that when you are done frying them, you have a clean plate to place them on - no cross contamination. 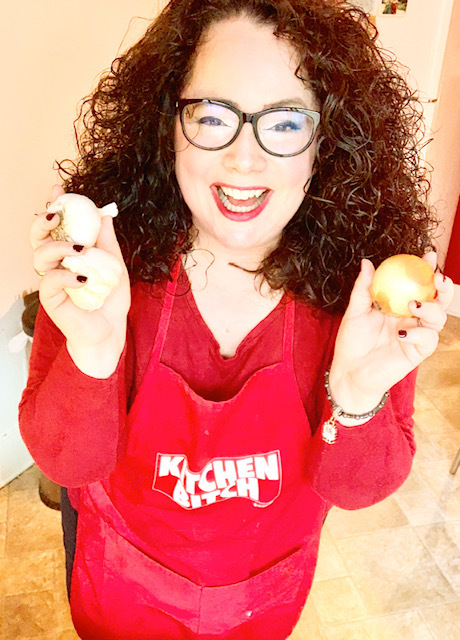 This is important because some people forget this little tidbit that can prevent them from getting ill.
Chop up white onions (they're sweeter) into ringlets. In my opinion, it makes the dish look better as well as caramelize more evenly. Put them in separate bowls, add a little olive oil, parsley, salt and pepper into a pan and let it get hot....then throw them right in. Add some lemon & white wine into the mix and let it sauté for a bit before placing the liver into the frying pan. Start cooking your vegetable. With this dish, I always prefer fresh from the farm market veggies - not frozen and not boiled too much. It gives the dish even more iron. Brussels sprouts are known to be rich in iron as well, or you can make a big spinach salad to compliment it. Throw the puppies into the frying pan. Make sure you let them brown. Should take approximately ten or twelve minutes, depending on your stovetop. Multitask! Make sure you're watching your veggies so they don't get too soft, and sauté your onions and mushrooms, adding in a tiny bit of sugar in the raw for more of a caramelized effect. Watch your house smell like heaven when this combo is brewing together. After frying your liver, place them on paper towel and then lightly blot them with another one on top. This will absorb the olive oil so you won't have greasy livers. You end up with this beautiful dish that'll enhance your physical and emotional health. No psychotherapy required. And the results from your dinner guests? First you want to start off by chopping fresh parsley, onions and scallions, throwing in 2-3 already cooked potatoes with the skin still on them. Chop them all together until finally blends all evenly. Prepare your pan with heating up a tablespoon of butter, and yes, a fatty strip of bacon. (Everything tastes better with bacon!) This really flavors it up. Add your spices, like salt, pepper, garlic powder and a touch of chili powder to give it a slight kick. Stir it up and don't let it get stuck to the pan. Some of it will, but that's okay. Throw the pig in the pan, so it'll cook while you're making your delicious home fries. I usually set it to "5" on the stove so it cooks evenly and it doesn't get too too crisp, nor too rubbery when undercooked. Bleck. When your first bacon strip looks cooked - chop it up in tiny little pieces and throw it in the home fries. Then, add your home fries into the middle of your eggs in a straight-ish line, along with strips of cheese. Then, fold. It's so important to use a non-stick pan! Also, use Pam cooking spray for the omelet because it works so much better than say, butter or any other type of oily substance. If you use butter, sometimes it'll stick to the pan leaving you with a holy omelet. Cut the omelet evenly in half and place each of them onto a slice of bread and add your bacon. And voila - put it all together and you have heaven in approximately 10 minutes. Bon appetit! Memories of barbecues and family functions out on our patio after a long day of swimming makes me wonder if my barbecuing mimics a portion of that time. I remember I never liked steak. It was chewy and thick and very cumbersome to eat. I wanted something simple like hot dogs or hamburgers. Those were easy on my choppers. I couldn’t understand why everyone wanted to chew on leather. But to them, it wasn’t leather, it was the best part of barbecue... at least to them. Dad would fire up the grill and we would set the picnic table up with paper plates along with forks and knives to hold them down in case a breeze came through. Mom prepared potato salad, fresh string beans and a fresh garden salad as well. Corn on the cob was always invited to the barbecues. Dad would throw every piece of meat into a large pan and then placed it onto the table. Even in the winter, dad was still outside barbecuing whenever we were in the mood for burgers, and they were craving a steak. He’d be out there in his little hat and winter jacket with a cigarette dangling from his mouth. We’d be in the living room watching TV, until we heard the loud deep voice call out, “Come on! Don’t let it get cold!!!" We were at the table faster than anything. As an adult, I realized a few things, especially living in a condo with no barbecue: you don’t need a grill for a good steak. In fact, I prefer to pan sear my burgers inside along with onions and mushrooms. But, we’re tawkin’ steaks here. And I did develop a love for steak, unfortunately for the most expensive kind: filet mignons. Champagne taste on a beer budget, but at least I won’t be at the dentist with a loose tooth because I chewed on a piece of leather. A delicious steak has a couple of secrets when being made inside. 1. The marinating & seasoning process. Some people don’t season their steak and wonder why they don’t care for it much. All you need to do is add a pinch of salt and a generous amount of pepper. Pepper tenderizes your steak and gives it a great flavor. I use a dash of garlic powder and depending on my mood, I use a touch of balsamic vinaigrette and if I have it (which is a lot better) a touch of Pepsi. It tenderizes the meat like nothing else. I learned that tip from my sister. 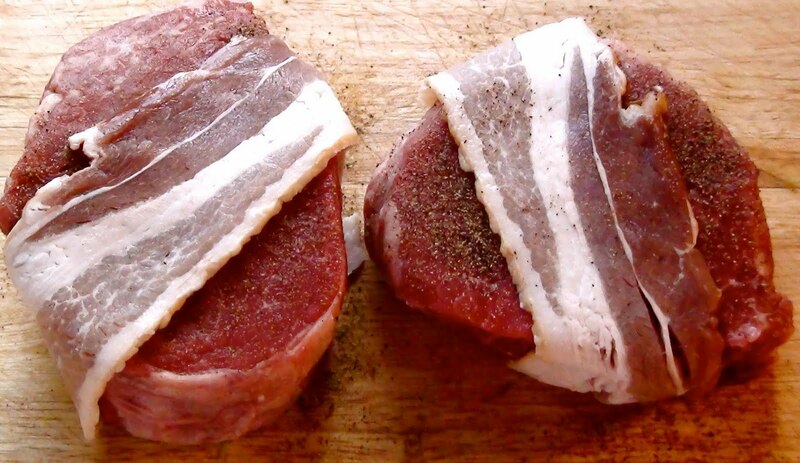 Depending on how daring you are, sometimes I’ll wrap a piece of bacon around the filets. Everything tastes better with bacon, right? 2. Take two pans out. Chop one onion into rings and add raw mushrooms into a small amount of olive oil. Add a tablespoon of sugar for the caramelization of the onions, parsley, a pinch of salt and another generous amount of fresh ground pepper. Add some parmesan cheese into the brew, mix until it starts to soften up. You can add white wine to it, but most of the time, you don’t need it. While the onions and mushrooms are reducing, add a little bit of bread crumbs into it, to give it some substance. This is for your topping. 3. Put your other pan on high, get her hot & ready... I spray a touch of Pam onto the pan so it doesn’t stick. 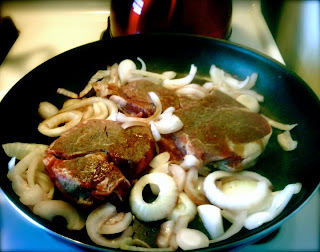 Add some raw onions on the side so it also creates a little more juice and flavor & then throw your beautiful filets on there. Keep her on a setting of 7 for a good 5 minutes so she’ll sear on one side, then flip them over and keep it on a setting of 4 for about another 8-9 minutes or so covered. You’ll have perfect rare filet mignons. 4. Place on a dish, pour the toppings onto the steaks and add whatever vegetable you want on the side. I usually eat veggies with no carbs with my steaks, since it’s so filling as it is. For a beverage, I prefer to drink a Malbec or a Cabernet. If not wine, I would choose a beer such as Sam Adams, or some type of ale to your liking. The flavor of the ale and the richness of the steak is an incredible combo. So get out to the store, go to your butcher, get your filets & bon appetit! 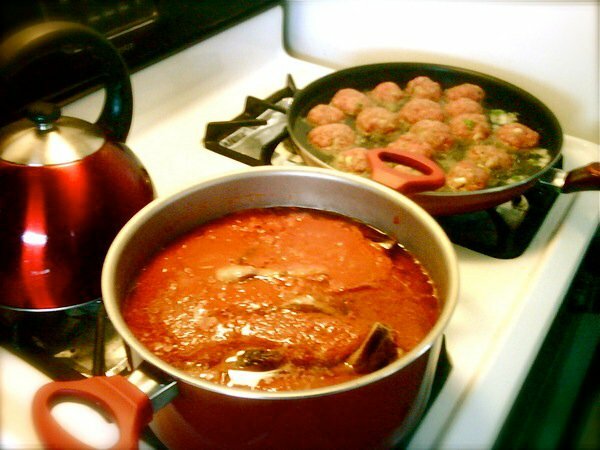 While growing up in an Italian household, it was known that aromas of fresh Italian food would be wafting into your bedroom at 8am on a Sunday morning. You’d hear the sounds of the blender as it chopped up tomatoes for the gravy (and yes, we called sauce “gravy”), and the wonderful smell of meatballs being fried. I’d tumble out of my bed with my yellow feet pajamas and make my way into the kitchen. Even before breakfast, mom would hand me a meatball on a fork on a tiny plate just out of the frier. It was as good as it smelled. I used to watch her as she sautéed her beginning concoction of the gravy. Olive oil, chopped garlic, fresh parsley, salt, pepper and some crushed red peppers as well. The entire house smelled like love. And that’s what it was all about: love. When you walked inside the house, love was in the air, as corny as that may sound. Mom did it for us - as a family. 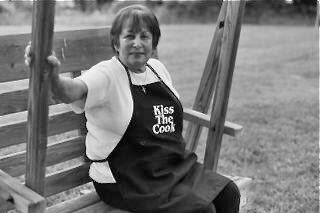 She spent so many hours in that little kitchen of hers, and surprisingly, tons of huge pans of food came out of that tiny cucina. Dinner was always served at 2pm in the afternoon every single Sunday. 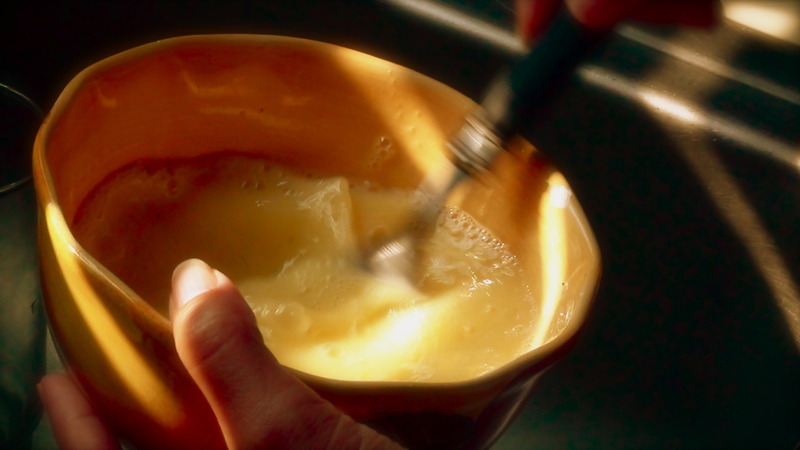 As an adult, I incorporated a lot of what my mom did in the kitchen into my own, however, I tweaked my ingredients a little to protect my palette from the intense acidity as I grew older. My stomach doesn’t handle gravy like it used to, so I had to use ingredients my grandmother used, like onions and a bit of sugar to lighten up the acidity of the tomatoes. One sure way to rid of acidity of the tomato is adding just a pinch - and I mean a tiny pinch of baking soda. For me, I don’t. But here’s what I use... While sautéing my herbs in the olive oil: 1 bulb of freshly “sliced” garlic - not chopped, a half of a white onion (they’re sweeter), fresh parsley, salt, pepper, fresh basil - I then add a tablespoon of sugar in the raw and stir until the garlic is ‘slightly’ brown. You don’t want to overcook garlic, because it then becomes a little bitter. The secret of my ‘gravy’, or sauce, is that I prefer mine to be very light, not clumpy where if you scoop it up, it’ll stay on your fork. I like my sauce thin, light, able to be eaten without a ton of antacids afterwards. So, I add in a half a cup of chicken brother while it simmers. I then add my own crushed tomatoes, I use vine tomatoes, some people use plum. It’s whatever you prefer. I then add 1 can of Contadina tomato sauce and stir. While that’s cooking, I add in 1/4 of a cup of table wine, like Carlo Rossi - a young wine where it’s sweet and not vinegar. Stir... Then, I throw in approximately a half a cup of grated parmesan cheese. Stir.... Depending on how many ‘tastes’ from the wooden spoon you get, spice it up again to your liking - if it needs more salt, more pepper, more whatever. I then put a lid on it, but tilted, so it gets some steam coming out and it will not boil over. Let that cook for a good 30 minutes before adding any meat into it. Meatballs are so much fun to make, especially if you have little ones. They love to help with projects like these. With a package of chopped meat, approximately 2 1/2 - 3 lbs, you throw it into a huge bowl and mold it to the sides of it, so you can add all your delicious ingredients. Time to get the knife and cutting board! Start chopping a half 4 cloves of garlic, dice a half of an onion and a heaping handful of parsley. Try to chop everything finely, so that when you eat the meatball, you won’t have chunks of herbs sticking out, but enough to flavor it wonderfully. Throw the freshly chopped goodies into the meat. Throw 2 eggs in there as well (I use only 1, most people use 2) and add a half a cup of parmesan and a half a cup of breadcrumbs. Sprinkle some salt and pepper to liking along with garlic powder. Time to get your hands dirty (after you’ve washed them). Squish, mold, squish, mold, until your ingredients are all mixed into a bundle of love. Start packing the meat into the size of an ice-cream scooper. I usually prefer my meatballs smaller than the average ‘tennis ball’ size, so it’s up to you. They’re easier to cook when they’re a tad smaller than the norm. When you’re all done rounding these puppies out, heat up your pan of olive oil and then cook the meatballs till they brown. 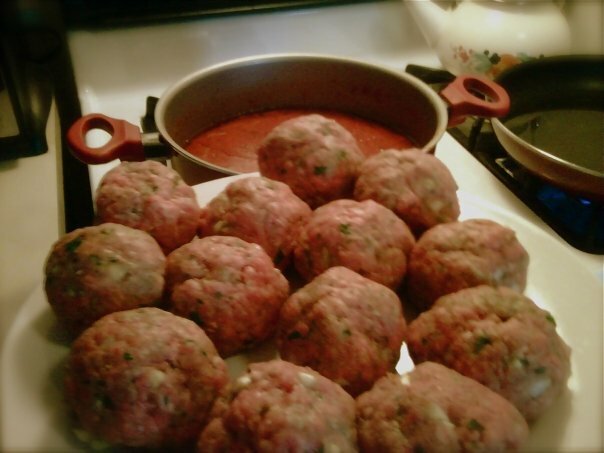 Do not overcook them, in fact, some people add raw meatballs into their sauce and let it cook for over 2 hrs. I don’t advise this. It tastes so much better when it’s fried and crisped before entering the fiery pit of my gravy. I learned this not only from my mom, but from watching my grandmother as well. My mom would always yell out, "Get out of the kitchen, ma", as both tried to fight for the control of the cucina. Remember, let your meat cook in the sauce for 4-6 hours. Not only will your house smell incredible, but it drums up the appetites of whoever is lounging around on a lazy Sunday afternoon. Just boil your pasta or lasagna - whatever type of dish you're making and voila --an incredible dinner for an army. Bon appetit! Food has always been a huge part of our lives while growing up. 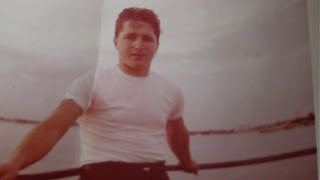 My mother was a ‘stay at home mom’, after working years before she had children, and my dad owned a fish market over at the South Street Seaport in New York City handed down by his father. Needless to say, every Wednesday he would come home with different types of fish, from blue fish, salmon and tilapia filets to calamari, shrimp, clams or mussels & over spaghetti. I never knew what it was like to live without fish. On Christmas, both my parents would team up and make The Feast of the Seven Fishes - an old Italian tradition that really never left us. It would start out with a fresh squid salad along with scungilli, baked clams, shrimp cocktail & fried shrimp along with the most delicious crab salad, with a few lobster claws thrown in. The only “fresh water” fish was a white filet of some sort, whether it was tilapia or yellow tail, I’m not sure. But the main course included whole lobsters stuffed with breadcrumbs and herbs that were just to. die. for. When my sisters and I got older, I realized that one of my sisters including myself developed a slight allergy to shellfish. We had to be careful, carry Benadryl with us every single Christmas. Luckily, we were okay for the most part. When I began cooking as an adult, I always included fish to my entrees. 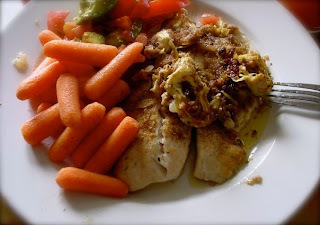 My favorite fish to bake has to be tilapia, because you can make it in so many different ways. It’s fun to tinker around with. This particular dish is tricky, kinda-sorta. I first clean the fish thoroughly and dose it up with lots of fresh lemon juice. I then chop garlic and parsley and throw it into a pan with a small amount of olive oil. I season it with salt, pepper, garlic powder and a touch of white wine. I also add artichoke hearts sliced up into quarters. I let it sauté for about 3-4 minutes before I add my fish into the pan. While it’s frying and cooking most of the bottom part, I scoop some olive oil to the top of it with lemon, and add a bit of parmesan cheese along with some breadcrumbs to give it a crunch. I let it cook for only 3-4 minutes, and then place it into a baking pan for the oven. I then broil it on low for approximately ten minutes---no more because it’s already been cooking on the pan and then blast the last couple of minutes on high to give it that ‘crunch’ on top. When it comes out of the oven and you’re going to prepare plates, make sure to topple the fish off with the artichoke hearts and a dash of parmesan cheese for garnish. Served best with a light Pinot Grigio or a delicate Chardonnay - not too buttery. Bon appetit!